The first cool drafts of the evening descend after a strenuous day of riding as your crew paces gradually up the final ascent to the town ahead. Its good to know that your gear is dry, packed inside your Ortliebs. In fact, you’ve felt assured this whole week as you’ve been chased by storms. That mid-week downpour caused no worries. Instead it brought relaxation as your crew soaked it all in, during a day of sharp contrasts, carving through canyons and over raging rivers, swooping through rollers, transitioning between blowing clouds and bursts of sun. 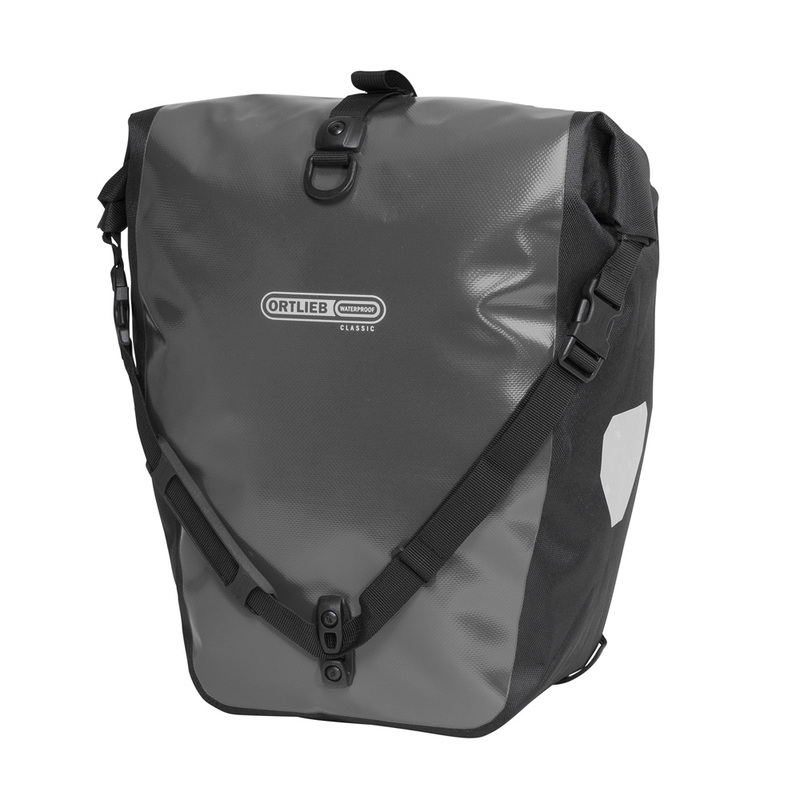 You’re relieved that your friends took your advise to choose Ortlieb panniers. You all smile and enjoy enjoy a collective gloat over supper. You folks really know how to get away. Q: What differentiates the Back Roller Classics from Ortlieb’s other rear panniers? Rails integrate with the Ortlieb Pannier Security Cables-Long for locking to your cargo rack. The unrolled material extends 28cm / 11″ above the upper hook rail. For minimizing capacity, all of the extended fabric above the upper hook rail can be rolled up. The rolled-closure straps buckle to an included 69cm / 27″ adjustable length shoulder strap. A hook on the bottom outer facing surface of the pannier, is used for hooking the shoulder strap to when closing the pannier for cycling. The shoulder strap can be quickly removed from the hook and adjusted for use as a shoulder strap off of the bicycle. 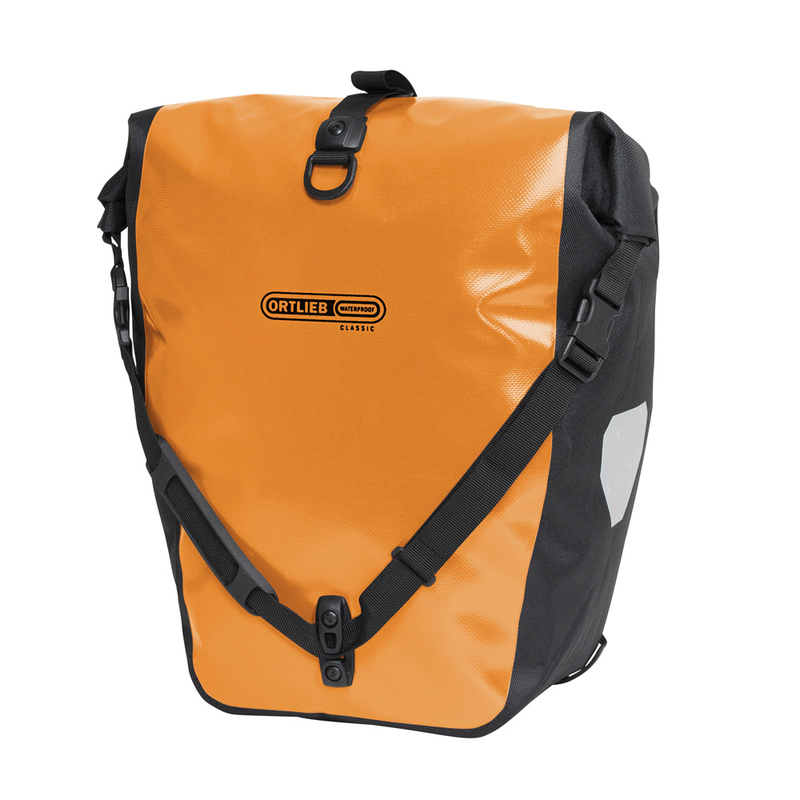 Alternatively, the shoulder straps can be left behind and the rolled-closure straps can buckled to each other to close the pannier and also serve as a handle for carrying the panniers. 6 = Dustproof, no penetration of dust. The main pocket is open without a closure. The secondary outer mesh pocket has a zippered closure. Positioned on the front and rear facing panels of each pannier for reflecting automobile lights at night. Built like a battleship - this thing actively clips on to my rack. it was easy to set up and fit to my rack. It rolls shut with just a one clip - unusual - but simple and waterproof. I only wish it had a small outer pocket for keys,wallet,etc. But I knew this beforehand - the description was quite clear. Pricey? You get what you pay for - this thing will last! They had the best price on the Ortlieb panniers and when someone else's order was accidentally shipped to me, I got a replacement shipment right away. Stuff happens, but BikeShopHub took care of it quickly. I've been using a knockoff of these back roller classics for the last several years. Mostly commuting to and from work on my 1985 Diamondback Apex. I wish I had bought the Ortliebs the first time around as they hold more and are a better design. Very happy with these bags. And they arrived very quickly. These bags were great on my road bike, carrying changes of clothes and laptop to and from work with ease. It was a different story offroad: a trip along a 60km fire trail resulted in the top mounting frame of both bags giving way, and the lower frame on another half coming off. The tiny screws bite into plastic, and when the going gets rough they're just not strong enough. I'll be replacing these with bolts and nuts and oversized washers.